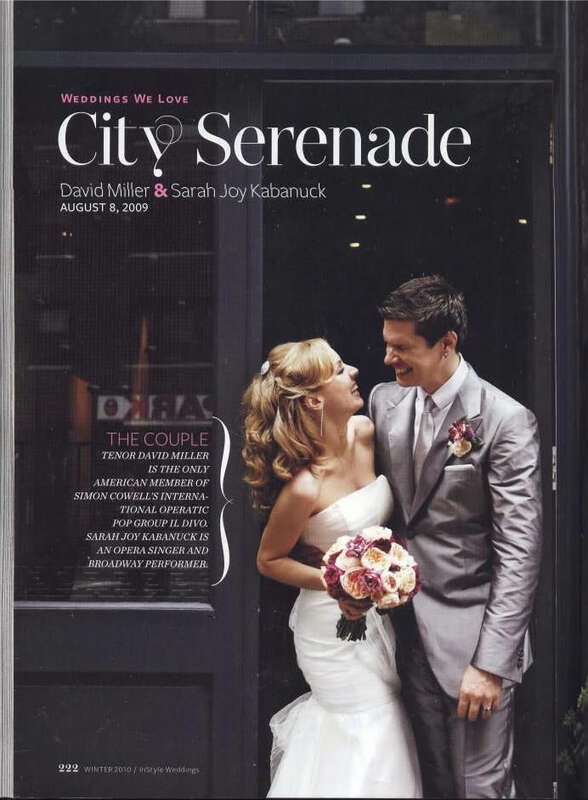 In the Winter 2010 "InStyle Weddings" Magazine issue, David & Sarah Joy's wedding is featured. This issue was just released this week and I was soooooooooooooooo excited to see David & Sarah Joy featured in this issue. They are such a fantastic couple and you can just see how happy they are by their picture!!!! Here are the pages they are featured on. Here's a copy of just the photo just in case anyone wants it! Tenor David Miller is the only American member of Simon Cowell's International Operatic pop group Il Divo. Sarah Joy Kabanuck is an opera singer and broadway performer. Punch up a neutral palette with bright flowers in coordinating hues like these peach- and plum-tone garden roses. For an authentic French garden feel, Hatch Creative Studio lined the aisle with benches, bistro tables, vintage iron gates, and terra-cotta planters filled with hydrangea, dahlias, tulips and roses. Baker Ron Ben-Israel designed a winding blossom tree for the three-tiered cake. The branches were made of sugar paste and bloomed with sugar jasmine, hydrangea and cherry blossoms. A family pet deserves a special spot in the bridal party. 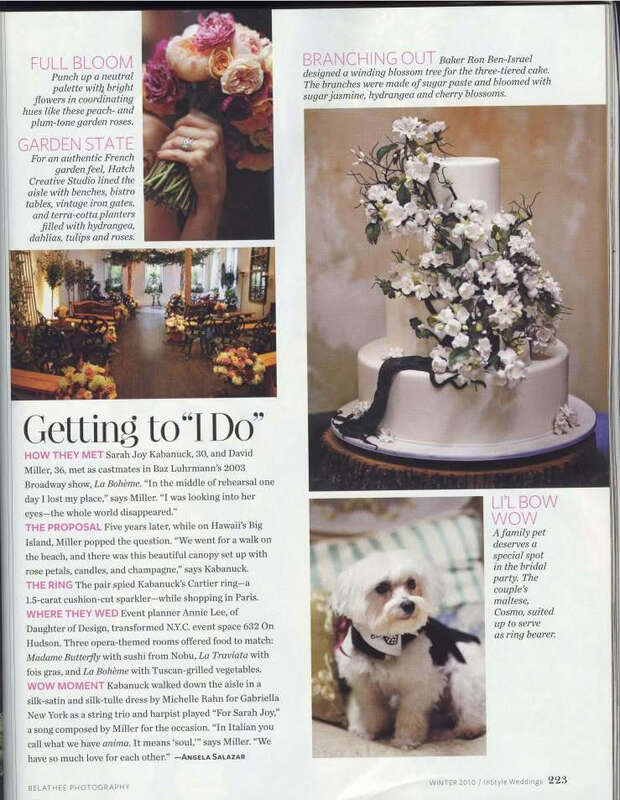 The couple's maltese, Cosmo, suited up to serve as ring bearer. HOW THEY MET: Sarah Joy Kabanuck, 30, and David Miller, 36, met as castmates in Baz Luhrmann's 2003 Broadway show, La Boheme. "In the middle of rehearsal one day I lost my place," says Miller. "I was looking into her eyes-the whole world disappeared." THE PROPOSAL: Five years later, while on Hawaii's Big Island, Miller popped the question. "We went for a walk on the beach, and there was this beautiful canopy set up with rose petals, candles, and champagne," says Kabanuck. THE RING: The pair spied Kabanuck's Cartier ring-a 1.5-carat cushion-cut sparkler-while shopping in Paris. WHERE THEY WED: Event planner Annie Lee, of Daughter of Design, transformed N.Y.C. event space 632 On Hudson. Three opera-themed rooms offered food to match: Madame Butterfly with sushi from Nobu, La Traviata with fois gras, and La Boheme with Tuscan-grilled vegetables.